In addition to standard medical care, at Southeast Alaska Animal Medical Center, we also offer alternative treatments. These modalities can speed healing when used in conjunction with surgical repair, oral and injectable medication. Both acupuncture and laser can also be used as stand-alone care. These treatments can be especially helpful to pets who are suffering from the pain and inflammation of arthritis, hip dysplasia, neck and back pain including disc disease. Unlike NSAID treatment, there are no negative impacts to the kidneys or liver with acupuncture and laser. 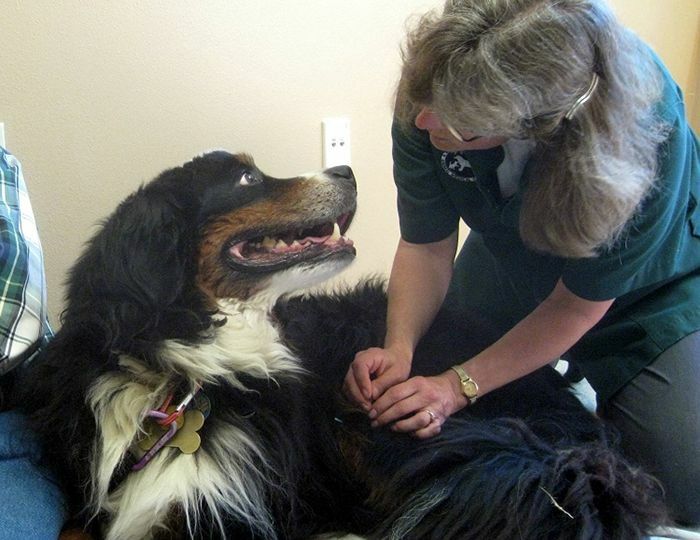 Bernese Mountain Dog, Frank, owned by George Utermolhe and Debbie Behr, receives acupuncture with Dr. Kramer. Nerve injuries — particularly certain types of paralysis. Lick granulomas and other skin issues. The length and frequency of acupuncture treatment depends on the condition of the patient. Typically, a dog or cat is treated once or twice a week and a positive response is usually observed after the first to third treatment. 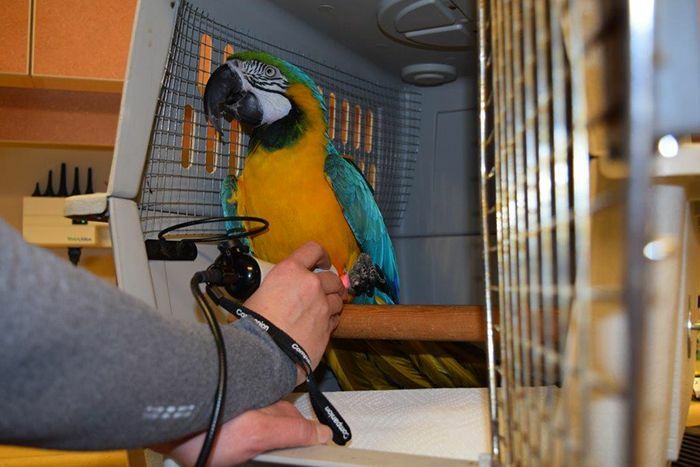 Rocky, a Blue and Gold Macaw owned by Jill Dowell undergoes laser treatment after surgery to repair his fracture. Laser therapy stimulates bloodflow and promotes healing in affected areas. This non-invasive therapy has long been used by professional athletes. More recently, human and animal medical practices have begun to use laser treatments to speed healing from injuries and incisions, and to reduce inflammation. Laser can decease healing time for involved wounds such as degloving injuries. Laser therapy can also be extremely helpful in chronic musculoskeletal conditions such as arthritis.